The new 2019 BMW X7 is the German automaker’s first large three-row luxury SUV. Until now, the only BMW that offered three rows was the X5, which has a very small optional seat that's barely fit for kids. 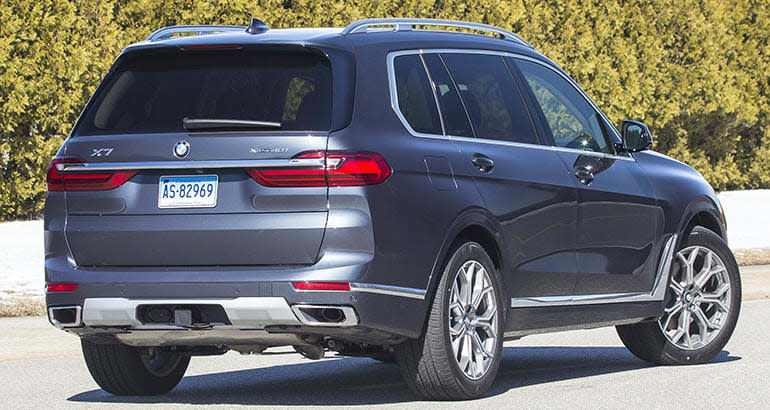 The otherwise high-scoring BMW X5 falls short on third-row space compared with its competitors, including the Acura MDX, Audi Q7, and Volvo XC90. BMW’s new SUV is bigger than all of those models, and it matches up well against large luxury SUVs such as the Cadillac Escalade, Infiniti QX80, Lincoln Navigator, and Mercedes-Benz GLS. We purchased our own X7, which we'll put through a full evaluation after we accumulate 2,000 break-in miles. But here are our first impressions. The 2019 BMW X7 builds upon much of what makes its little brother X5 CR’s top-rated luxury midsized SUV. BMW’s 3.0-liter turbocharged six-cylinder engine and eight-speed automatic transmission continue to impress us. This combination delivers immediate power and seems to anticipate what the driver wants to do. There's no hesitation from turbo lag, the delay that happens when the turbocharger needs to spool up to help make power. The smooth transmission performs every gear shift quickly and without hesitation. BMW has expertly tuned the transmission software to match the engine’s performance. So far, we’ve found the ride to be controlled thanks mostly to its air suspension, which uses air bladders to constantly adjust to changing road conditions. We rarely—if ever—felt an impact when the X7 drove over potholes and pavement ruts. Some drivers commented that the X7’s quiet interior is on a par with the large 7 Series luxury sedan. All sounds are well-isolated, never intruding on the cabin. 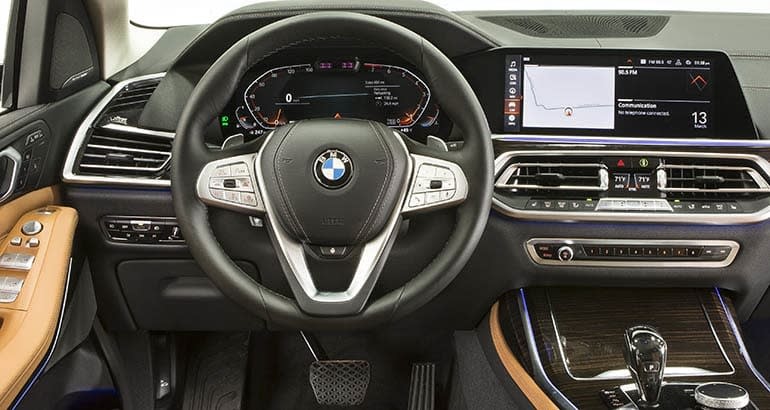 It’s only when the driver chooses the Sport mode that engine and exhaust sounds penetrate the silence, and that’s partly because BMW amplifies those sounds through the audio system via software. The interior is a delightful place to spend time, with all of the luxury that buyers expect in an $84,000 SUV. The X7’s rich, supple leather seats are supremely comfortable, and they have firm cushions that provide all-day support. There is wood, chrome, and high-quality plastic trim throughout, with soft-touch materials covering all of the key touch points. The tall windows and extra headroom give the cabin an airy feel compared with the smaller X5. Visibility to the front, sides, and directly back is very good. There is plenty of storage space up front, including a large compartment under the center armrest, two cup holders, and a big, lidded storage bin at the front of the center console. The rear doors are quite wide and create a big opening to the second row. 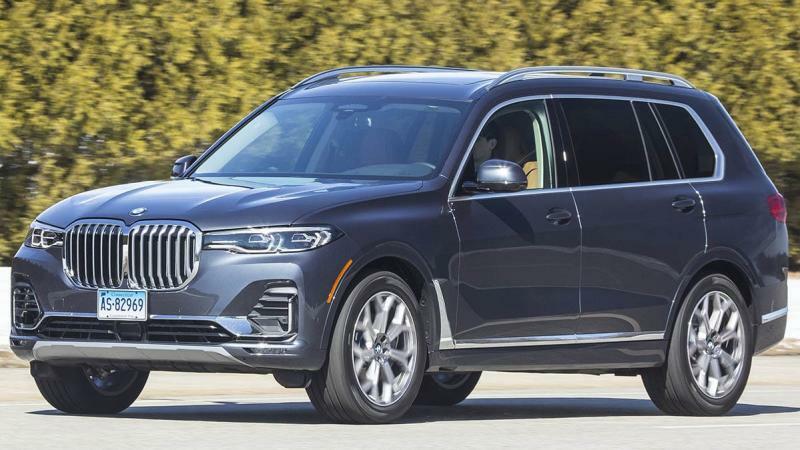 Our 2019 BMW X7 has the optional power-operated captain’s chairs, which are as comfortable and supportive as the front seats. In addition to being able to recline, they can slide forward and backward. Passengers can move the seats forward and backward and make them slightly rise by pressing a button by the side doors. That makes it easier to get to the third row. We like that the third row is accessible from both sides of the X7; some SUVs allow access only from the passenger side. The third-row seat has enough room for teenagers, and, unlike in the X5, adults can ride back there comfortably, too, but only for short trips. Opening the two-piece tailgate reveals a cargo area with a fair amount of room behind the raised third-row seat. Lowering the third row provides a very large space for luggage or other cargo. The seats can be operated individually, but there are also buttons to raise or lower them together. It’s also nice that one press of the power liftgate closes both upper and lower sections. The head-up display is one of the best and clearest around. The X7’s standard suspension height and wide doorsills make getting in and out a challenge, particularly for young children. Owners can program the suspension to automatically lower when the X7’s ignition is turned off to reduce these problems. All of the weaknesses of the X5’s iDrive infotainment system carry over to the 2019 BMW X7. The system is capable and quick to respond, but some functions are buried in menus and submenus, and can be difficult to find quickly. At first the controls and displays seem overly complex, but we found over time that most buttons are little used and just clutter the center console. BMW’s gimmicky gesture control system—which lets the driver make adjustments such as turning the volume up or down with just a wave of the hand—doesn’t really save time and may be confused by unintended driver movements. For example, we have muted the radio when raising a drink from the center cup holder. But this system can be disabled. There is scant toe room under the front seats, which forces long-legged second-row passengers to pull their feet back. Keep in mind that opting for the captain’s chairs means the cup holders are a long reach away—on the floor between the front two seats—making them a challenge to reach when buckled in, especially for children. The standard bench seat includes cup holders in the fold-down center armrest. The second-row door opening is big, and children can get to the third row easily if the second-row seats have been moved forward. Teens and adults, though, will find it a squeeze to get to the third-row seats. Once back there, the side armrests and consoles with USB outlets cut into legroom, forcing occupants to sit slightly angled toward the middle of the X7. And last, the captain’s chairs don’t fold down, so it’s impossible to put long, wide cargo in the X7. Buyers who need a huge cargo space should stay with the standard folding second-row bench seat. Our X7 costs $84,000, which is certainly a large sum of money. But unlike some other premium-priced models that we have recently tested, the X7 feels worth it. Other models in this price range come with clear compromises, such as the Lincoln Navigator and its bargelike handling or the Porsche Cayenne’s hesitation off the line and uncomfortably stiff ride. Many of the X7's luxury SUV competitors are large and heavy, and that can make them lean considerably when taking corners. We’ll keep an eye on how the similarly sized X7 performs in our tests, and if it lives up to BMW’s sporty reputation. The X7 has plenty of promise, based on our first weeks with it. We will soon see how it fares in our testing as we rapidly complete the initial 2,000 break-in miles.